The name Sam Richardson is synonymous with the game of Curling in Saskatchewan and Canada. The legendary success of the Ernie Richardson Team, with Sam as the second, is well documented. 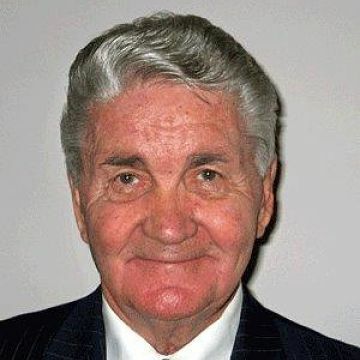 His curling career started when he was in high school and was made up of his brother Ernie and two cousins, Wes and Arnold, the team was also joined by Mel Perry in 1963. In 1955 the team watched Saskatchewan win their first Brier. The Richardson Team got serious about the sport and four years later (1959) they won their first Saskatchewan Championship, the Brier and the World Championship. The team went on to win 5 Saskatchewan Championships, 4 Canadian Championships and 4 World Championships between 1959 and 1964. In 1973 Sam also added a Provincial Mixed Championship curling with Ev Krahn, Glen Hall and Elsie Hunter. They finished in second place at the Canadian Championship. There are two stories about how Sam Richardson’s speaking career started. The first was that in 1959 his brother Ernie asked Sam to speak at a sports banquet in his place. The other was that in 1976 at a Brier Banquet in Regina the guest speaker John Diefenbaker fell ill and that Sam got the emergency call to take his place. It doesn’t matter how his speaking career got started, we are all just so very lucky that it did. Sam has won the admiration of many curling fans and non-fans alike as a gifted and entertaining speaker at countless sports dinners, curling related or otherwise, and numerous charitable events. Sam’s humorous stories have engaged many a crowd and has given the game of curling unique publicity nationwide. He has spoken in every town and city in this province and the message is always one that is mixed with his special brand of humour and a layer of seriousness. In the late 90’s Sam agreed to publish his biography. ‘Say It Again, Sam’. It is the story of a man, loved and admired for his skill, witt, and his generous nature, which has ennriched thousands of lives. It is not all about success as a curler, but about the grass roots of his life, the ups and downs, family and friends. Sam is a member of the Canadian Sports Hall of Fame; the Canadian Curling Hall of Fame and The Saskatchewan Sports Hall of Fame. He is a member of the CURLSASK Legends of Curling Honour Roll as curler and is a CURLSASK Life Member as well as an honorary life member of many curling clubs throughout Saskatchewan. In 2005 he was presented with a Saskatchewan Order of Merit, the Province’s highest honour. 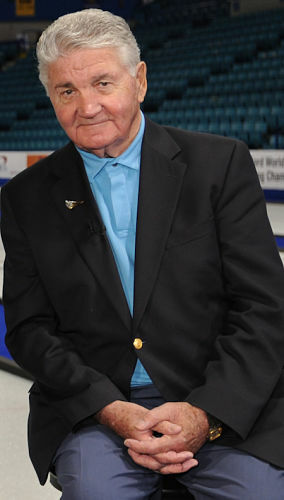 In 2006 he was the Honorary Chair of the Brier in Regina and was also presented with the Canadian Curling Association’s Presidents Award at that event. Everyone who has been involved with the sport of curling knows what Sam has given to not only this sport but to his community and to this Province.